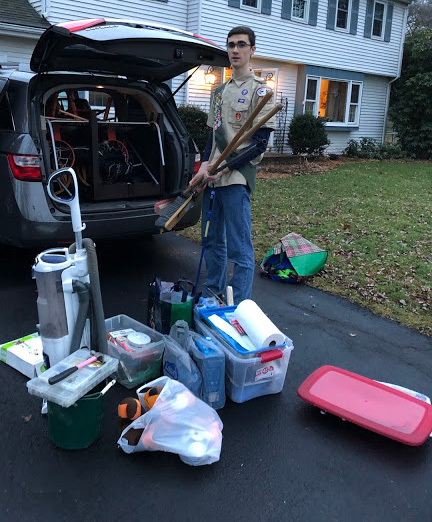 When Marshall, a Life Scout, contacted The Salvation Army inquiring about completing his Eagle Scout project at The Salvation Army’s Marshall House Family Shelter, it just made perfect sense! Marshall’s first experience with Marshall House occurred last summer when PW Power Systems (PWPS) held a volunteer workday at the family shelter. Marshall’s father, a PWPS employee, brought his whole family to help with outdoor and indoor projects on a Saturday morning in August. Marshall enjoyed the experience so much, that he couldn’t wait to help even more. This time, Marshall would be helping the Marshall House as part of his Eagle Scout project, and he’d be the one in charge! Two Saturdays in December, Marshall and Scouts from Troop 360 of the Church of Jesus Christ of Latter-day Saints (Manchester) worked on two children’s corners and a teen room. Marshall House provides shelter to homeless families year-round, and is one of the only shelters to accept infants. The children’s corners are a crucial part of the family shelter, as they occupy the younger children of the residents while social workers consult with their parents. As you would expect from an aspiring Eagle Scout, Marshall displayed natural leadership skills as he delegated the work to everyone. To help with the project, Marshall recruited 22 volunteers. Marshall was well organized, packing the car full of supplies and donated items, including refreshments for the volunteers, before dawn on the first workday. As part of their project, Scouts are encouraged to obtain donated materials for their projects, but Marshall couldn’t find anyone to donate paint and painting supplies. A major part of the project was the painting of the children’s corners and teen room, so obtaining paint was essential. After contacting a few major hardware stores and having no luck, Marshall, determined to procure the donated paint, continued to contact businesses that might help. Finally, it was Hartford Habitat for Humanity that came through with paint and supplies. PWPS employees had built five playhouses last summer for Hartford Habitat for Humanity, so that existing non-profit/corporate relationship was now benefitting The Salvation Army! With the rooms painted, Marshall wasn’t done yet. Newly painted rooms are beautiful, but to make them truly special places for kids and teens to hang out, they needed to be filled with fun stuff! Marshall coordinated the donations of games, a table and chairs, an indoor basketball hoop, ping pong and pool table equipment, and a Wii system and games. Some of the other donated items were books and craft supplies for teens and children, light bulbs, a carbon monoxide detector, and a smoke detector. As a finishing, festive touch, Marshall and crew strung Christmas lights throughout the rooms. Marshall couldn’t have done all of this work alone. 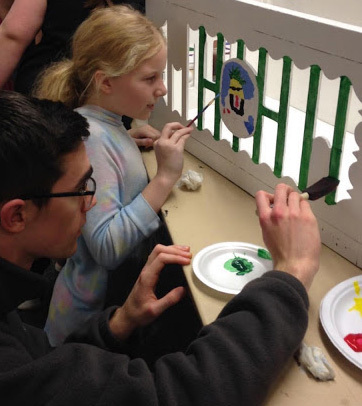 Along with the Scouts from his troop, Marshall also recruited several artistically gifted girls from his church, who helped paint a toy chest for one of the children’s rooms. 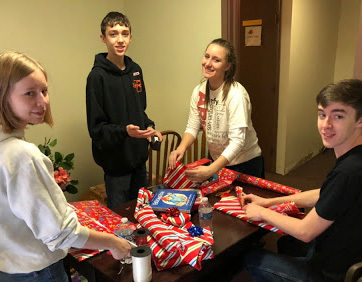 With Christmas right around the corner, Marshall organized a wrapping station, where he asked volunteers who weren’t busy painting to wrap some of the donated items for the younger children. Although the work that Marshall and his troop completed was required for a project, Marshall’s desire to help the Family Shelter extends far beyond that. Marshall is planning to return to Marshall House with more donated games, art hand painted by his friend to hang on the walls, and knobs to install on the game cabinet. Marshall has made such a lasting impression on Marshall House Family Shelter that it’s not a stretch to truly call it Marshall’s House. Learn more about The Salvation Army's Marshall House Family Shelter. 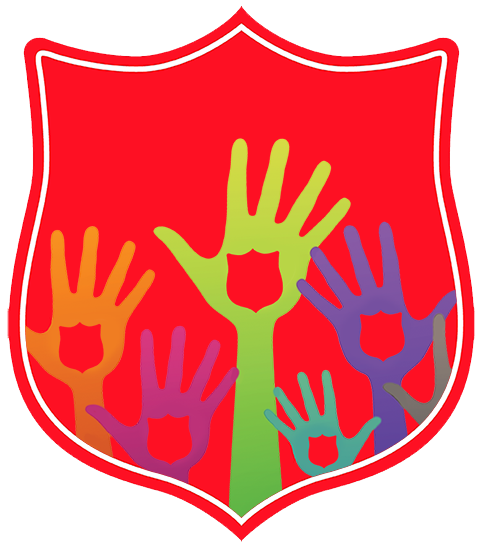 Become a Salvation Army Volunteer.